Pocketbook Plant gets its name from the puffy, brightly colored flowers that look like pouches or slippers. Other common names for this unusual-looking plant are Slipper Flower and Slipperwort. 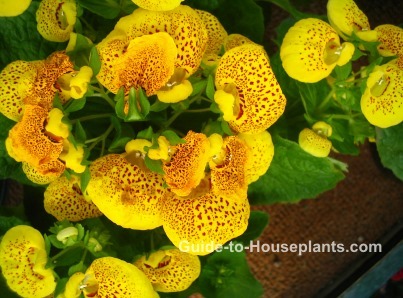 Clusters of these glorious, pouch-shaped blooms grow on tall stems above soft, green leaves. 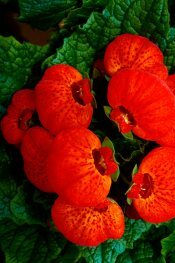 The heart-shaped leaves are deeply veined with scalloped edges, and reach 6 in (15 cm) across. Although their blooming time is short-lived, these unusual house plants are well-worth having around for their cheery spotted flowers. And why buy just one? Display two or three plants together in contrasting colors. 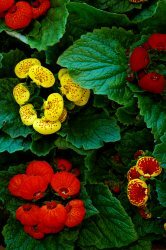 Their vibrant blooms also look dramatic beside tropical foliage plants, dressing up a Boston fern or maidenhair fern for a while. Choose a plant with plenty of unopened buds and you'll enjoy several weeks of blooms. Many flower colors are available -- yellow, white, orange, red, maroon or copper, usually with red, purple or brown spots. Popular cultivars include 'Anytime Mixed' and 'Gold Fever'. These hybrid plants are available in flower shops in spring, their natural bloom time. Find a spot for your plant that is free from drafts and direct sun, both of which will scorch its soft leaves. Check over the leaves and stems for aphids. These tiny pests are attracted to the soft foliage of plants. Treat an infestation right away -- you don't want insects to move on to your other houseplants. Keep pocketbook cool and moist and you'll enjoy its masses of blooms for several weeks. Discard it after flowering has finished. It's an annual and won't bloom again. Light: Bright light. Shade it from hot, direct sunlight which can scorch its leaves. Water: Keep soil evenly moist at all times. This plant may not recover if the soil is allowed to dry out. Avoid watering over the crown of the plant because it may rot. Humidity: Requires moist air. Stand the pot on a tray of wet pebbles to increase the humidity around the plant. Don't mist because water may damage the soft foliage. Fertilizer: Not needed; pocketbook blooms will flower for a season then can be discarded. Propagation: Sow seeds anytime. These hybrids are slow-growing, though. You'll wait 4-5 months for them to bloom.